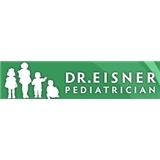 Dr. Eisner, Pediatrician (Houston) - Book Appointment Online! Dr. Eisner is an experienced Houston Texas Pediatrician providing excellent children's pediatric services. Personal care for each child, same day appointments, a friendly staff and new patients are always welcomed. Our Houston office offers same day appointments for our sick patients, and we are also committed to scheduling timely appointments for new or exising patients in the Houston area. This is our second visit with Dr. Eisner, we absolutely love her! She's great with my 4 year old, he plays while she examines him and addresses all of my concerns. She's now seeing our newborn as well and that was a great experience!